Scissors have been around for 3,500 years, but they are sharper than ever. Permanently sharp, Never need sharpening! These words proclaim the virtues of a new generation of scissors—good news, yet a slightly sad epitaph for an essential and treasured tool invented many centuries ago. Like many early tools, made with great effort and time one by one, scissors were clearly treasured by their owners. Until the Industrial Revolution, most of the objects needed for daily life like paper, cloth, metal, pottery, ceramic and glass objects were made by single craftsmen and craftswomen and their helpers. Many last names we take for granted today were acquired originally as descriptions of crafts and trades: Goldsmith, Weaver, Taylor, Fuller, Baker, Skinner, Potter, Smith, Tinker, Wheeler and Wag(o)ner. The objects they made were created to last a long time if not a lifetime. Metal objects were therefore incised with elaborate designs; both blades and handles reflected whimsy and art, as well as utility. The idea that their work was sufficiently cheap and available that it could be thrown away and easily replaced would have struck them as utter madness. 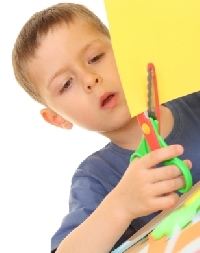 Researchers into the history of scissors generally agree that scissors were invented in Egypt around 1500 B.C.E. and were first fashioned of bronze, spreading slowly through the rest of the ancient world through trade and exploration. These early scissors were, as best archeologists can determine, made of a single piece of metal. They were mechanically two levers joined by a loop which served as a fulcrum. Each sharpened level was a scissor, and the pair was called, scissors. On about 100 A.D. Roman craftsmen developed cross-blade scissors. That is, the blade-edges crossed and slid past each other when cutting. The looping fulcrum remained. Even now, gardening catalogs in the U.S. and Britain offer grass-edging shears that demonstrated the cross-blade principle. Like the Roman model, these scissors rested in an open position after use. As is the case with so many early tools, the question of modification and innovation remains in the dark. At some point, someone clearly realized that greater control with less hand strength could be obtained by separating the scissors into two pieces anchoring them with a screw or rivet and making loops for fingers. Looking at old scissors suggests that for a number of centuries, depending on the country of origin, both designs coexisted with craftsmen and purchasers deciding which design served specific purposes: cutting grapevines, thin sheets of metal, paper, thread and cloth. The final step in creating modern scissors is documented. In London in 1761 Robert Hinchcliffe developed the method for steel-casting scissors. What he produced took the form we recognize today. Early scissors, were, of course, sharpened. To denote and protect their sharpness, scissors were often encased in a leather cover, similar to the sheath for a knife. Like knives, over the years in many cultures scissors became the focus of folk superstitions, some of which exist in less fearful form today. The first is that scissors, like a knife, should never be given as a gift. Doing that will cut the relationship between giver and recipient. The usual evasion of the dangerous qualities of this gift was the playful purchase of the knife or scissors, and the amount was small ranging from an English half-penny to a shiny U.S. dime or quarter. To this day, those giving a gift of cutlery often tape a penny to the package in case the recipient does not know that sharp gifts must be bought. In some cultures the cutting qualities of knives or scissors meant that they were not passed hand to hand but rather set down for a friend to pick up thus preserving the friendship. Old wives said that cutting worked more than one way: a pair of scissors placed under the pillow of a woman in labor or a person with a painful injury would cut the pain in half. And, whether given in a case or not, scissors were sometimes hung by one handle on a hook beside or over the door, their open position forming a crude cross and their exposed sharp blades threatening damage to any evil influences attempting to enter the house. Clearly the history of scissors would not be the best choice for a factual sixth-grade report. As with many inventions, modifications and improvements on an original idea came, like the idea itself, from obscure people who were too busy working to realize they were becoming a part of history. There's a certain pleasure in this obscurity. The history of scissors is the history of ordinary people making their way through the world and solving problems, very much the way we do. Now, don't run with those—they're history! What contributes to a sustainable community? Which spy pen is the best?